The summers in Japan are humid and hot, hot, hot. The last thing you want to be doing after a long, sticky day of work or touring around is cook up a steaming meal that heats up the kitchen. 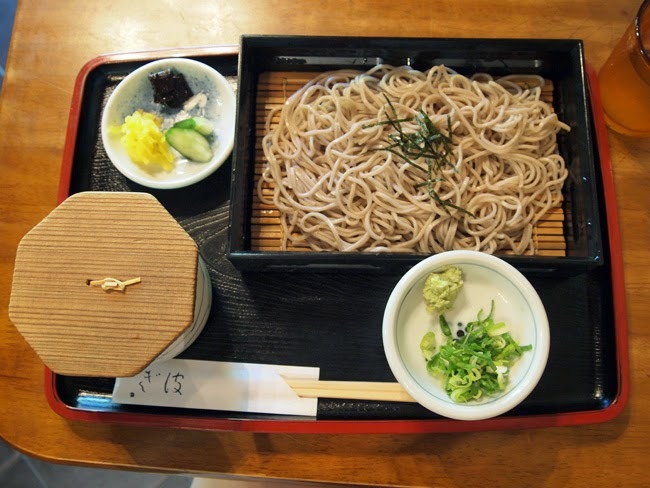 That's where ざるそば (zaru soba) or cold soba comes in. 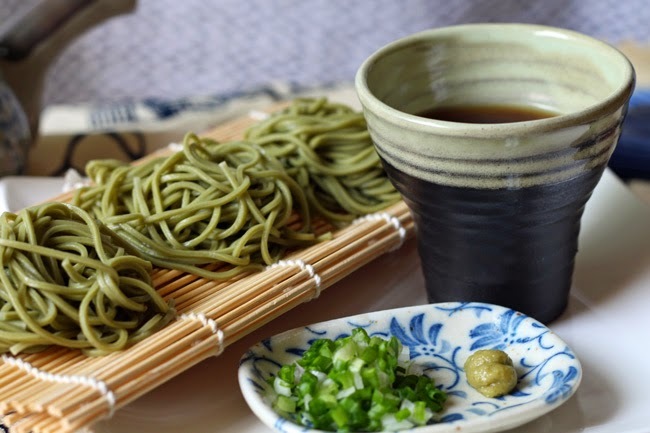 Fresh, cool soba noodles dipped into a cold tsuyu, or broth. If you're not familiar with the dish it might sound odd, but I can assure you, there is nothing more refreshing or satisfying on a hot day! Now, seeing as it's September it would have made much more sense for me to share this recipe a bit earlier, say in June, but, well, I forgot. However, it's still very, very hot here in Al Ain, so the recipe is still "seasonable"! If it's still warm where you are or you're having an Indian Summer, give it a try and I promise it will transport you straight to the streets of Gion. Mix the soy sauce and mirin into the prepared dashi stock, then place in the refrigerator to cool. 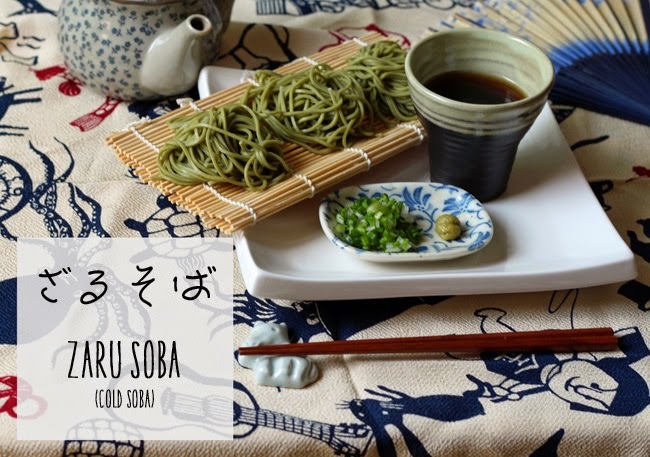 While the tsuyu is cooling in the fridge, cook your soba. 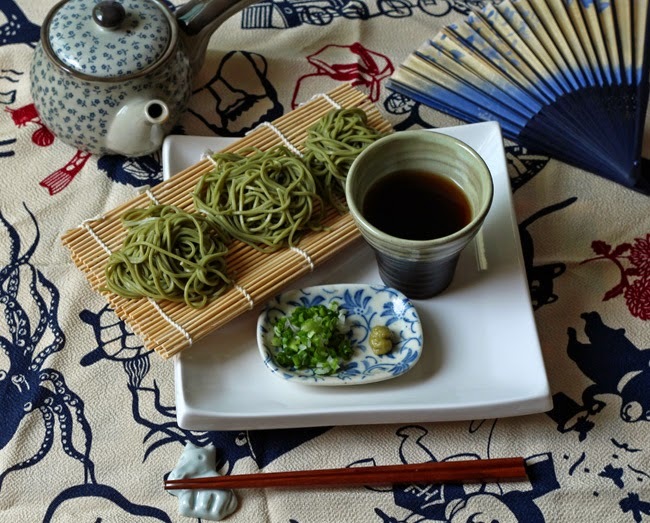 I used dried matcha soba noodles, because that's what they had in the shop. Just prepare them according to the package instructions. Once they're ready, drain the noodles then run cold water over them to cool them down. You can even put them into an ice water bath if you live in the desert where cold tap water doesn't exist this time of year. 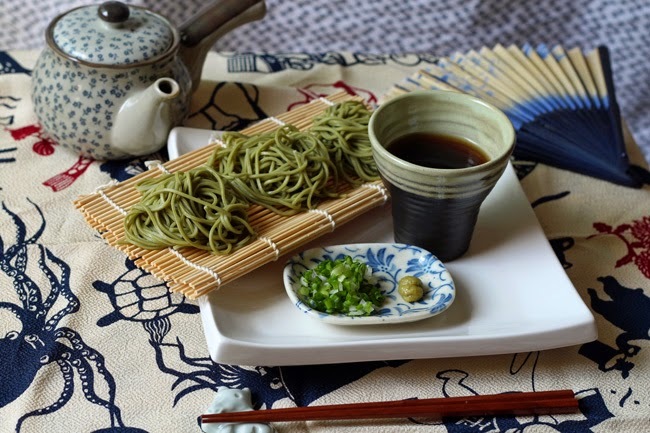 To serve, twirl several noodle "nests" using a fork, or chopsticks if you're brave. Ladle some of your cold tsuyu into a little bowl or mug, but don't fill it to the top (trust me!). 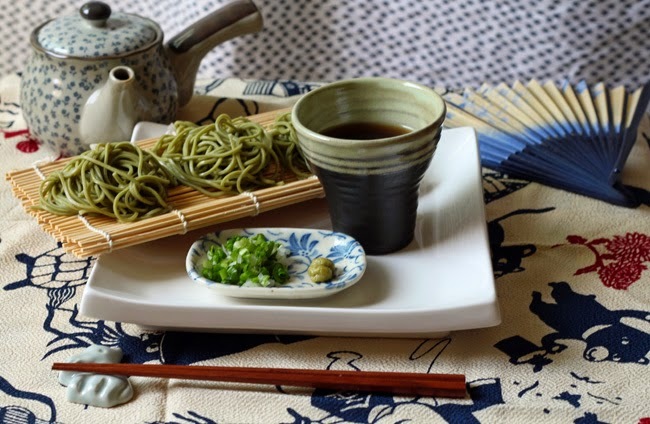 To be extra Japanese-y, place a dollop of wasabi on the plate next to the noodles and a little pile of green onions. Now let's eat! First, put a little wasabi into the tsuyu (this is optional, of course) and swizz it around a little with your chopsticks. Sprinkle a little handful of green onions into the tsuyu. 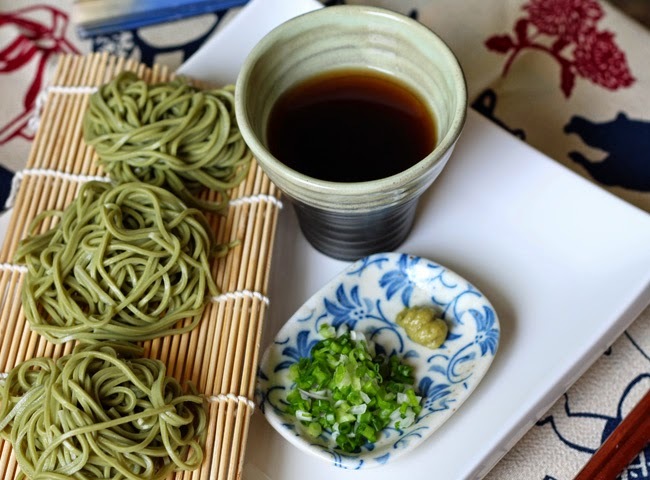 Now, pick up a whole nest of noodles and place it in the bowl of tsuyu (this is why you don't want it filled right to the top!) Pick up the bowl and use your chopsticks to sort of shovel the noodles into your mouth. Slurping is absolutely mandatory, especially if you're in Japan (although I hate it). Continue with the rest of your noodle nests until there aren't any left. Lastly, if you haven't over-wasabi-ed your tsuyu, you can drink the last of it. 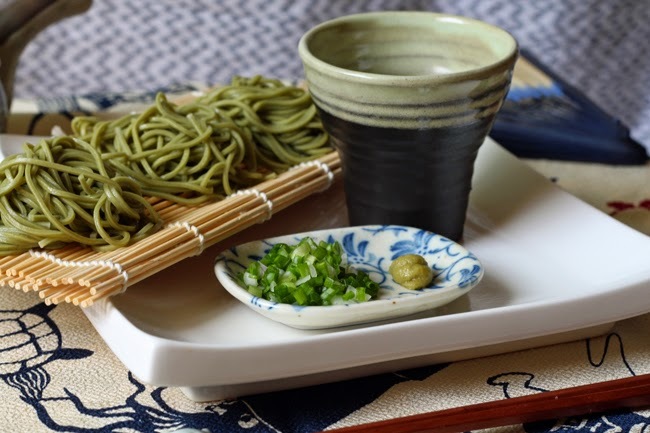 At many traditional soba restaurants in Japan they will actually bring you a little tea pot of the water the soba was boiled in to pour into your tsuyu for drinking. Now, doesn't that make you want to hop on the next flight to Japan? I know I sure do!